Finches are social birds who live happily in mixed gender pairs as well as with same-gender companions. 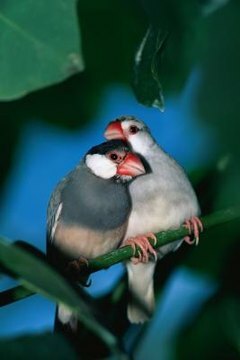 If you do not want to breed your finches, then you must be able to tell the males from the females and separate them. Failure to separate male and female finches will result in a nest full of baby finches living in your cage. Many types of finches are considered to be sexually dimorphic, which means that the male and female finches can be identified based on their physical markings. Male finches have brighter colored markings than females. Males can have brightly colored cheek patches and breast bars, and also may have spots on their flanks. Seasonal changes in plumage can occur in male finches, making them bear more of a resemblance to the females when it is not breeding season. The markings of a male finch who is experiencing seasonal molting may be more muted than those of the same male during breeding season. Female finches do not change their markings based on the seasons and always will have the same appearance. Female finches are subjected to the courting behaviors of male finches during breeding season. Observe your finches to see if one of the birds is singing, hopping, preening himself and generally putting on a show for the other bird. The bird who is displaying the courting behavior is male. Male finches also are the only finches who can sing. Females may chirp or make occasional noises, but females do not sing. Female finches will lay eggs regardless of whether they are with a male finch. If your finch is laying eggs then she is female. It is almost impossible for a person who is not an avian expert to tell male finches from females based on the sexual organs. If you have no idea whether your finches are male or female, take them to an avian veterinarian to determine their gender.